“A carnival performer often billed as a wild man whose act usually includes biting the head off a live chicken, bat or snake” . Yuck, is probably the first word that comes to your mind after you’ve read the definition above. Well, as disgusting as the description seems, it just happens to be one of the explanations for the word geek. In daily life however the word geek refers to a highly intelligent and capable person who lacks social skills. Such people usually keep to themselves and have very few friends. They utilize most of their time reading or doing some brain intensive activity, which tends to give them an edge over others. In the 21st century however, no one really wants to be a geek. Now that the internet has become a very intrinsic part of our life, even the geeks have chucked away their books and have gone in for a digital transformation. A transformation that has created a new species called “The Technosexual Man“. The technosexual man (woman currently lag behind in this race), is a smart,successful, intelligent person with a strong aesthetic sense and a love of gadgets. This term which was first promoted by creative professional Ricky Montalvo combines the term “technophile” and “metrosexual“, and refers to a straight man who is in touch with his feminine side but has fondness for electronics such as cell phones, PDAs, computers, software, and the web. The European Organization for Nuclear Research, commonly known as CERN is the world’s largest particle physics laboratory, situated just northwest of Geneva on the border between France and Switzerland. Its main function is to provide the particle accelerators and other infrastructure needed for high-energy physics research however the word WWW(World Wide Web) was also born here. The World Wide Web began as a CERN project called ENQUIRE, and was initiated by Tim Berners-Lee and Robert Cailliau in 1990 (See here). At CERN one can watch artisanal physicists actually make their own antimatter. You can also peer into the Large Hadron Collider â€” which is 17 miles of super conducting magnets!. If you really wanna visit CERN then book your trip least four months in advance, or else you’ll be left out in the cold. 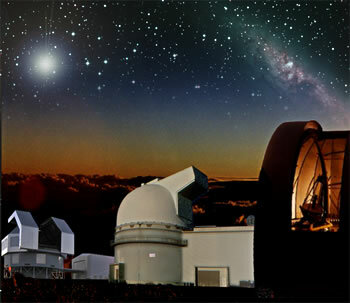 The Observatories at Mauna Kea are an independent collection of the world’s premier astronomical research facilities, located on the summit of Mauna Kea on the Big Island of Hawai’i, USA. The facilities are located in a 500-acre special land use zone known as the “Astronomy Precinct,” which is located in the Mauna Kea Science Reserve. Mauna Kea is both a sacred and historical site in the Hawaiian culture and one of the most important land-based astronomy sites in the world. The location is ideal because of its dark skies, good astronomical seeing, low humidity, clean air, good weather and almost equatorial location. The University of Hawaii manages the site and leases land to several multi-national facilities which have invested more than $2 billion dollars in science and technology. The Astronomy Precinct is located on land protected by the Historical Preservation Act for its significance to Hawaiian culture. So if you thought that hawaii was just about sunny beaches then you were mistaken. At mauna kea one can stop at the visitors center, where you can view sunspots during daylight hours. The observatory is at an altitude of nearly 14,000 feet, and gets really cold after dark, although you’ll get an amazing view of the night sky which looks really spectacular when you can see all the stars together (something that is rarely visible in big cities). In the past few years, New Zealand tourism has seen major growth mainly due to the fact that various superhit movies have been shot there. These include both bollywood and hollywood movies. Peter Jackson’s blockbuster Lord Of The Rings trilogy made the term “Middle Earth” synonymous with the New Zealand landscapes. If you’re a LOTR fanatic then do take the Lord Of the Rings tour(see here) and you’ll be amazed to find out that the rolling hills of Matamata was Hobbiton, while the volcanic region of Mt Ruapehu was transformed into the fiery Mt. Doom where Sauron forged The Ring, and Queenstown, New Zealand’s adventure capital, was the setting for numerous scenes including the Eregion Hills, and the Pillars of Argonath. And now, if you really wanna be the ultimate techno-sexual man, then make a visit to the South Pole. It costs around $5,000 and can be damn cold (minus 76 degrees Fahrenheit in winter), but a cruise around Amundsen-Scott South Pole Station will warm any geek’s heart. Alternatively, sign up for a working vacation at McMurdo Station. It has the bleak landscape and soul-numbing chill, but there are bars to go to at night! The places above talk about four different locations in four different continents that would excite any technosexual man or geek. However, if your are also keen on history and technology then another continent worth visiting is South Africa. South Africa is the place where Mahatama Gandhi was inspired to start a revolution against the British occupation of India. It is also the place where Nelson Mandela spent 18 years in prison in Robben Island. The best way to start discovering these historical landmarks is by looking up flights to johannesburg which is the largest city in South Africa. In Johannesburg you can find the Robben Island Museum dedicated to Dr.Mandela as well as Gandhi’s old house located in a quiet suburb of the city called Krall. Well written piece as usual. If only we could check out things without labels, the world would probably be a better place. Even the word “check out” has connotations and connotations are usually the product of a wretched mind. I ask then why do we add suffix’s such as phile and sexual to words to describe certain type of people. If we are really advancing towards a new age then what’s up with all these mating calls and chants – or is this simply language that is gently telling us that we have perverted existence? Surely the future does not need to be the bottom rung of a Maslow hierarchy, for then we continue to see the world from mindsets that were established eons ago, rather than emerging mindsets that are in line with progressive discoveries and new frontiers of the human mind. Then again, maybe the reason we look for vacation spots today is that because all of the above is becoming that much bizarre, that much more convoluted – that we have no other choice than to get away from all of this philo-sexual product attraction.